In the United States, suppressors (often referred to as “silencers”) are regulated largely by the 1934 National Firearms Act. Although they are generally legal for individual ownership (following the required application and taxation process), some states such as California, Hawaii, Illinois, Iowa, Massachusetts, Minnesota, New Jersey, New York, Rhode Island, and Vermont do not allow such ownership. In the event’s press release, The Silencers are Legal Campaign and the American Silencer Association state a common goal of educating the public that suppressors have the ability to save hearing, improve accuracy, increase situational awareness, and most importantly, save lives. 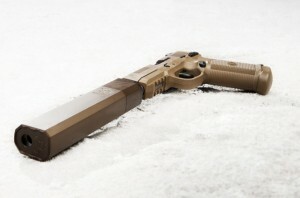 Interested parties are urged to visit silencersarelegal.com for more information. During the April 28 event, which promoters say promises to be the “most hands on, educational and exciting gun show of the year,” attendees are invited to bring their own firearms and test out cutting edge suppression products. It should be noted that the promotional materials state that all live fire must be suppressed as no unsuppressed shooting will be allowed, so attendees may be able to cross ear protection off of their list of items to take with them. The event offers a (much quieter) alternative to displaced firearms enthusiasts wishing to attend an interesting spring shoot, falling just over a week after the now-canceled Spring 2012 Knob Creek Machine Gun Shoot. For more information and to get tickets for this event, visit the SilencerCo Events page. Proceeds from this live fire event will go to benefit The American Silencer Association, a non-profit trade association established in 2011 by parent companies Silencerco/SWR, Advanced Armament Corp, and Gemtech. The ASA mission is “to further the pursuit of education, public relations, legislation, hunting applications, and military applications for the silencer industry”. For information on how to become a vendor or sponsor at the Silencers Are Legal Shoot, interested parties may contact Kenny Bozich. for his site, since here every material is quality based information.